Very nice, but when I set them as my race, it just showed a giant exclamation mark. I don't know what happened. Read the installation instructions. It sounds like you're missing textures/meshes, which means you didn't download the requirements listed in the description, or you installed them in the wrong place. Very pretty, but are they really mannequins? I don't want to play as an actual living mannequin, too eerie for me. If you can do this. Could you port or make lip gloss for F3? So, makeup in this game doesn't work like it does in newer Bethesda games, where you can change the makeup color/style at will with separate overlays. All makeup and lip color is part of 1 single texture for the entire face, and anytime you want to change the way your makeup looks, you would need to completely replace the face texture in the mods folder. Personally, I am not adept at texture making at this time, so I can't create any face textures of quality but... all that being said, there are quite a few face texture mods on the Nexus that have makeup already on them. You might be able to find a face texture that has a lip makeup you like. Copied from my post in New Vegas: "Authors like you, zzjay, make fans come back to the Fallout games again and again. I like that and thank you". 2. Load the .esp with the custom race. 3. Find the custom race you want to play as (under Actor Data). Double click it. 4. Under the "General Data" tab find the "younger race" category. Just remember what that is. Close the custom race. 5. Open the corresponding younger race. Set "Older Race" (also under the "General Data" tab) to your preferred custom race. The drawback to this is that you have to do this for each custom race race you want to play as. So if have a mod that adds the option to play as a ghoul or as a cyborg, and you want to do play through as each, you'll have to make the change for ghoul playthrough and then again for your cyborg playthrough. (If you plan to do both at the same time via Mod Organizer, you'll have to install the mod twice under different names.) You'll also have to redo this if the mod updates--unlikey at this point. A more thorough fix would be to create a unique child race for your custom race or for each race in your esp. This shouldn't be especially difficult if you don't mind your child-PC looking like a member of a vanilla child race. Just copy the relevant child race. Instructions on custom races can be found all over the internet so I'll let you figure that out. I went ahead, like he mentions in the last paragraph, and cloned the Caucasian Race child, set the "Older Race" to the Mannequin Race that I use, and set the "Younger Race" to the Caucasian Child I duplicated, so now I have a custom child to go with the custom race. Now I can do this two more times and assign those duplicates to the other two Female Mannequins. So, if I've done this correctly, I will only need the "Broken Steel Fix for Custom Races"
Also, for some reason the Default Mannequin Female has the default hair 2sKs? (something like that), but she shows up in the GECK as bald with an Exclamation point. (I updated the esp, and downloaded the WANDA hairs. Thanks for the run down on how to fix the ESP for people who don't want to use the Tranquility Lane Custom Race Workaround. Yea, it's weird, because the character loads fine, with hair, in the character creation menu, just not in the GECK. Mkay... you're awesome !! This is a "complete" port of this mod. Well done. I really do appreciate a mod author that does things proper from the start. Also, one that makes edits/corrections, right away. The other port of this mod, by Aloot didn't work. Even with the Tranquility Lane Fix in place. Dad still had the purple head when exiting Tranquility Lane. You're promising me that this port will not produce this glitch? If so, bless you for the fix. I'm curious as to how you fixed this. Also, I'm guessing you included the paths to the Megaton Hairs in this esp as well. Not sure as I haven't examined the esp file yet. From your description page, this seems to be the case. If so... Thanks. The Tranquility Lane Custom Race Workaround is just a script that prevents the game from completely changing your race when it can't find a corresponding child race for your custom race. Even though you can use console commands to change your race after you've left Tranquility Lane, you will have lost perks and other attributes in the process. So the fix doesn't actually do anything in the way of you and dad's race, it just keeps the game from breaking by stopping you from changing races at all (so you'll just remain an adult Mannequin Race while inside Tranquility Lane). The reason dad was turning out bald and purple is because the paths for the male textures were set up wrong, and the default hair was set to null. This was an issue in the original mod itself, and not the fault of the previous porters. As for the Megaton Hair, all paths for hair that were included in the original Mannequin Races mod are included in this ESP. If any are missing, then it's because they weren't in the original. If for some reason the hair isn't working, it would be an installation problem with the hair textures/meshes. Thanks for the response. This all makes complete sense to me. I'm sure if I need to, I can add the other hairs that might be missing to your esp file, via the gheck. Again, thanks for the fix. I'm also pretty sure if there's any head and body mismatch, I can just change your esp file to an esm with FO3Edit. I counted the hairs in my esp and there are 49, which matches the amount listed on the Megaton Hairs description page, so you should be good to go as far as the hair goes. Just make sure you download the mesh/texture file for the "Wanda" hairstyle. It's the last download on the files page. 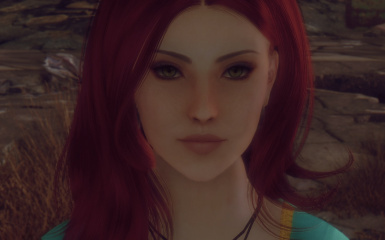 I had missed that one when I first installed Megaton Hairs and had the red exclamation point before I realized it was because that particular hairstyle wasn't in the main download. 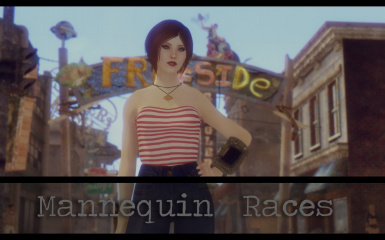 @ Aloot : This mod is missing flags to make the hairs show up in the famale race window for the face gen. They are missing the: Playable, not male data flags. The following hairs do not show up in the Mannequin Race mod: Envy, Erratic, Get Up, High Life, and Ivory. They are all missing the flags for the female race. 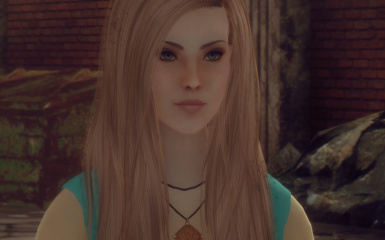 On a side note The Unlady Like vanilla hair does not show up with the Mannequin Race mod either. I think it got omitted some how. These edits are all correct in the Megaton Hair mod, just not for this mod. It would be wonderful if you could address these issues and update the Mannequin Mod. It's an issue from the original. I can't speak for everyone else who didn't notice, but for me, I never counted how many hairstyles were available to me in character creation since there are already so many ready to use. My short term memory isn't good enough to have realized that a handful of hairstyles from the photos on the Megaton Hairs page weren't in my game. Actually, I could use the fix too. As I don't have the gheck installed any more. An update would be great. The only reason I ever discovered this, was because I wanted to use the High Life hair and noticed it wasn't in the creation window. The fix is so easy. All it involves is checking a box next to ea. hair style that needs it. Simple. It was actually harder installing the gheck. The fix is posted now. Yeah, the GECK and Creation Kit and all that can be a pain to use. The fix was also doable in FO3Edit. I only use GECK if I reeeeally have to. Ok thanks. I used the gheck to make the fix myself, after reading Zzjay's explanation on how to add hair styles to his mods. I didn't even consider FO3Edit. Thanks for that heads up. It's amazing all the stuff you can do with FO3Edit. I couldn't mod my game without it. Hmmm, All I get is floating eye in the character creation screen, and when I pick mannequin eyes, they're purple, meaning they're missing their texture, and if I go ahead and OK my character anyway, I end up a headless character with floating eyes, walking around inside a giant red square with an exclamation point in it. So, I'm also missing the mesh as well. I have other mods installed like DC Delight.esm, Hairpack.esm, Project Beauty.esm, but I have this mod at the bottom of my load order and only get floating purple eyes, while the other races, like "Goth" etc show up. I'm confused, and also a moron for not reading the description page fully. Nice move, xtif, bringing zzjay's girls over here.